The Aprilia SR range has been expanded to incorporate New SR150 Race, Aprilia SR150 facelift and limited-edition Carbon SR150. Prices start at INR 70,031 – 81,211 (ex-showroom Pune). 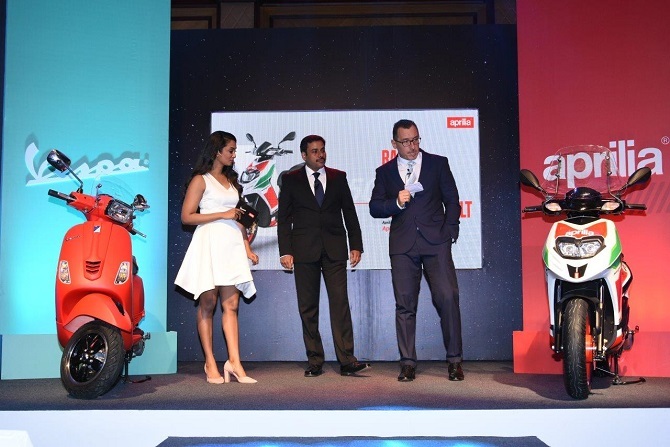 With festivities round the corner, Italian bike and scooter maker Aprilia has given enthusiasts a reason to cheer by launching 3 different variant of the SR 150 in India. Lets first begin with the new Aprilia SR150 Race that features Moto GP inspired colour on its body. Thus this particular scooter wears white base with red and green body graphics. There are 14-inch red coloured alloy wheels, an adjustable suspension, 220mm disk brakes and golden caliper on offer. Features include a digital console alongside a tall wind screen. To attract customers the company is also giving away a race themed helmet with the bike as well as factory fitted mobile connectivity feature. Priced at INR 80,211 (ex-showroom), the Aprilia SR150 Race comes equipped with a 150cc 3 Valve engine that provides map sensor technology with an enhanced CVT gearbox. Meanwhile the Aprilia SR150 Facelift will now be offered in four new colours. These include matt black, blue, glossy red and white. Mechanically everything remains the same, the only thing which has been altered is the availability of an adjustable suspension. Price for the Aprilia SR 150 Facelift is INR 70,031 (ex-showroom Pune). As the name suggests itself, the limited edition Aprilia Carbon SR150 is inspired from the carbon components in high-performance Aprilia track bikes thus representing the theme via carbon design and aesthetics. With an all black paint schemes, the scooter bears carbon graphics and has a new adjustable suspension. The Carbon SR150 features 14-inch wheels, 220 mm disk brake, a new digital cluster and a USB port for a price of INR 73,500 (ex-showroom Pune).